Hello – Kon nichi wa – こんにちは。it’s me, Merlin turning Japanese for a day to celebrate Nyan, Nyan, Nyan or Japanese Cat Day. “Nyan” is the Japanese equivalent of the “meow” sound and “ni” is the Japanese word for number two. February 22 (written 22/2) is pronounced “ni ni ni”, which apparently sounds close to “nyan nyan nyan”. Sounds good to me. Japan has one of the highest number of cats per capita in the world. 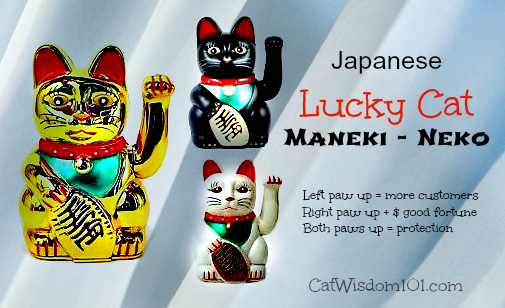 They are famous for the maneki-neko (beckoning cat) a talisman believed to bring good luck. We have several at our house and maybe that’s why I’m still alive. My mom, Layla was playing with me, you might say, pulling my leg. Aren’t human idioms silly? I feel pretty lucky all things considered. 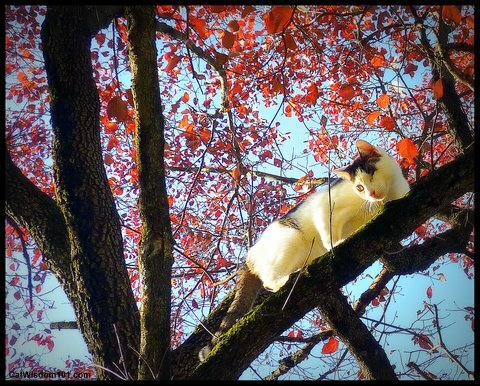 I found this old pic of Odin channeling his inner maneko-neko in a Japanese maple tree taunting the birds with his nyan, nyan, nyan. I don’t know if today is an official bank holiday but a Japanese bank did this funny video with cats recently which requires no translation. Enjoy. Isn’t it great to know cats are the messengers of smiles wherever you live? See you next week for the next Mondays With Merlin. I didn’t know you’ve been to Japan! Awesome to have a maneki neko from Japan. Those always remind us of our pal Maggie. Very pretty! I love Maggie’s lucky cat book and stickers. Great post Merlin. I love the photo of you with your Mom. We have 2 small lucky cat statues, one came with a book explaining the history. Happy Nyan Nyan Cat day! We aren’t sure what they were trying to advertise in that commercial, but it sure was funny! It’s an ad for a bank. You are a lucky cat to have Layla as your mum, Merlin, but she is equally lucky to have you. Kon nichi wa, Merlin san. As Japanese, I am very much aware of this day 🙂 I know you are very lucky kitty to have such a wonderful home and family! So glad you stopped by and purrs to Goro Goro and Niko. 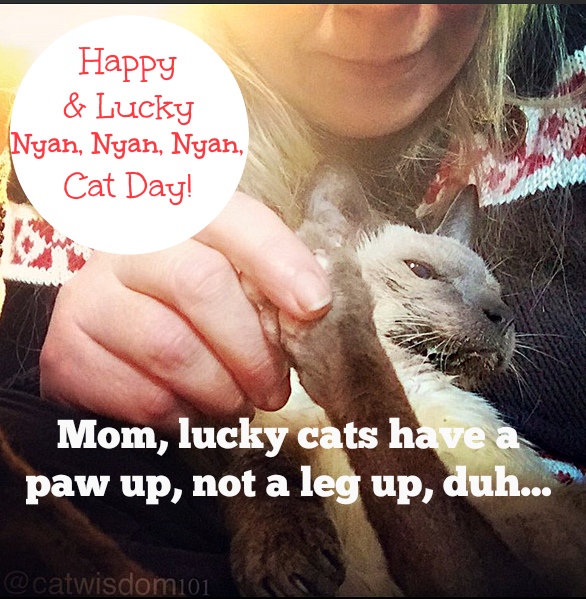 Oh a perfect day to celebrate – wonder if I could talk Mom into extra treats as part of our celebration?! We don’t have a Lucky Cat but probably should……never hurts to be “covered” !! Happy Nyan Nyan Nyan Day! Cute video. Happy Nylon day. I’ve heard Japan has wonderful cat cafes too. Kon nichi wa arigato nyan nyan nyan from Mao (learning to speak Japanese in addition to Mandarin 😉 and Ched, who only speaks fromage. That was a great video and a great post! 🙂 thanks and we are keen to be fluent in fromage. Perhaps Ched can tutor us? Easy, I would get a black one with both paws up and placed in the center of your home and white or gold one with the right paw up and placed in the SE corner for $ luck this year. Happy Nyan Nyan Nyan Day!!!! Everyday is lucky cat day here! 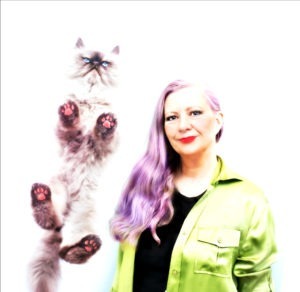 Happy Cat Day to you and your lucky cats! I have always loved those Japanese cats but dont have any around! Many are so pretty and brightly colored. Nyaan Nyan Nyan to both you and Layla, enjoy the day !!!! Thanks Ellen. There are so many styles and sizes available online. We need to have American Cat Day! Who do I need to speak to about this? Summer, we do have one on Oct. 29! It’s the day our cat cruise adventure sails on.